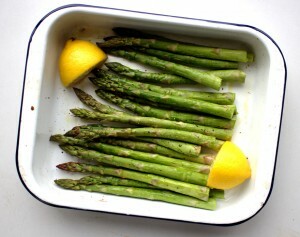 Roasted Lemon Asparagus - A quick and healthy side dish! Roasted lemon asparagus is one of our favourite side dishes. Did you know that asparagus is a good source of folate and of vitamins A, C, E and K? Oh, and it’s super delicious too! As a child, I never ate asparagus. On honeymoon in Florida a few years ago, I still remember tasting delicious asparagus for the first time. Up until then, the asparagus I had tasted was all limp and bland. The secret to delicious asparagus is not to overcook it. Since going grain-free, we eat asparagus a few times a week in our house. It’s packed with nutrients, easy to prepare and most importantly, it’s quick! We’re all about quick, healthy meals at home. As all of you can identify with, our busy lives don’t allow us a few hours a day to cook from scratch. When I first began the Specific Carbohydrate Diet (SCD), I used to spend hours cooking. Now, two years on, I am a more savvy cook. I keep the long cooking sessions for lazy weekends when we’re at home. Freezing batches of our favourite meals for busy days is a lifesaver! I only have time to prepare quick vegetables during the week. A few of our favourites are :this roasted lemon asparagus, sauteed spinach and cauliflower mash with thyme. To prepare the asparagus, simply wash and dry them. Then trim each asparagus, just to remove the woody end. My daughter just loves the heads and will only eat them! To reduce waste, you can add the ends to a stock if you’re making one. If you love this roasted lemon asparagus recipe then you’ll love my dairy-free asparagus soup. Apparently asparagus grows quite well in Ireland so it’s next on my list to plant in the garden. If only I had the time for getting around to all my to-do lists!